In keeping with the theme of last-minuteness today, I thought I'd share one of my absolute favorite dessert recipes ever. Because I'm the type of person who lays in bed all day and then has 3 hours to do everything I need to get ready for a party, I usually use one of my go-to quick & easy recipes for potlucks. I'm usually in charge of dessert and I hate taking something from a bakery or grocery store, but when you only have a few hours it's difficult to put together some beautiful, homemade dish. 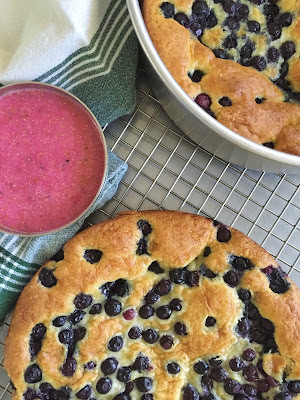 That's why I love this blueberry and meyer lemon buttermilk cake- it's summery, it's delicious, it's adaptable, and it's easy to make! 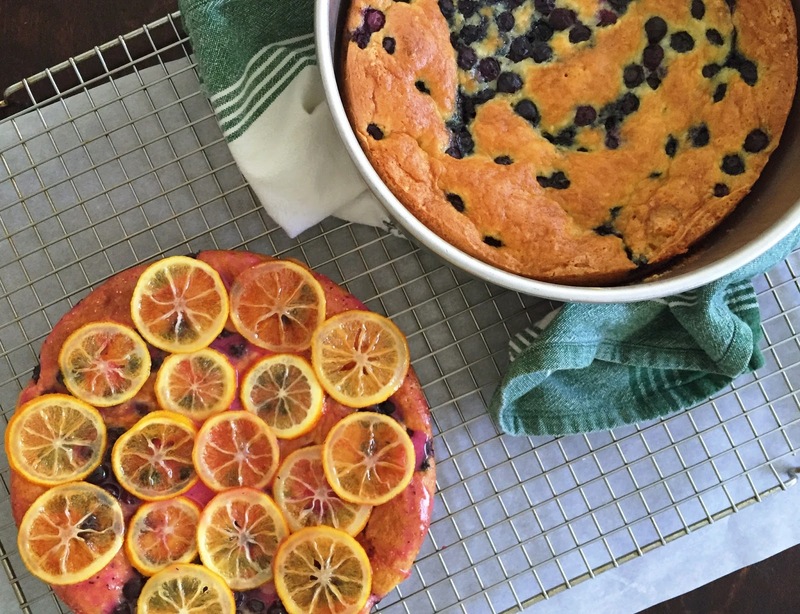 If you're looking for a sort of snacking cake or brunch item, keep this cake simple. For something a little fancier, use some glaze and garnish to dress it up (recipe includes instructions for both).You can add whatever fruit you have on hand and make it a cake for any time year (think about adding peaches & ginger, apples & cinnamon, blackberries & cardamom, etc. ), making this the perfect cake for any occasion. Preheat the oven to 400 degrees. Butter and flour two 8" cake pans and set aside. Whisk together the flour, baking powder, baking soda, and salt. In the bowl of an electric mixer, whip butter until light and fluffy. Gradually add granulated sugar, then add eggs one at a time and beat until combined. Add vanilla and lemon zest and beat well. Slowly add flour mixture and buttermilk, alternating between the two, until just combined. Fold in blueberries, then divide batter evenly between pans. **For snacking cake, sprinkle 1-2 T. granulated sugar over the top of each cake before baking to add a bit of crunch. Run a spatula around the edge of the cake pans and tap gently on counter to even out batter. Bake for 25 to 30 minutes, or until golden brown and cake tester inserted into middle comes out clean. Run spatula around the edge of the pan again and let cakes cool for 15 minutes before inverting onto cooling rack. While the cakes are cooling, place confectioners sugar in blender and add lemon juice and blueberries a little at a time until smooth. Allow cakes to cool for at least 30 minutes on rack before drizzling on glaze. Top with garnish like fresh blueberries, candied lemon slices, little dollops of creme fraiche whipped cream, or mint. Enjoy! Yasi "Or make one of each cake and eat it for every meal"